The name proposed by the GSI lies within the long tradition of naming elements to honor famous scientists. Nicolaus Copernicus was born on 19 February 1473, in Torún, Poland and died on 24 May 1543, in Frombork/Frauenburg, also in Poland. His work has been of exceptional influence on the philosophical and political thinking of mankind and on the rise of modern science based on experimental results. 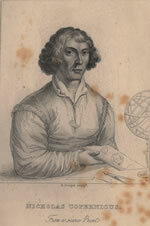 During his time as a canon of the Cathedral in Frauenburg, Copernicus spent many years developing a conclusive model for complex astronomical observations of the movements of the sun, moon, planets, and stars. His work published as De Revolutionibus Orbium Coelestium, Liber Sixtus in 1543 had very far reaching consequences. Indeed, the Copernican model demanded major changes in the view of the world related to astronomy and physical forces, and it had theological and political consequences. The planetary system introduced by Copernicus has been applied to other analogous systems in which objects move under the influence of a force directed towards a common center. Notably, on a microscopic scale this is the Bohr model of the atom with its nucleus and orbiting electrons. The Recommendations are published in the March 2010 issue of the IUPAC journal Pure and Applied Chemistry (doi:10.1351/PAC-REC-09-08-20). Priority of claims to the discovery of the element of atomic number 112 was determined by a joint working party of independent experts drawn from IUPAC and the International Union of Pure and Applied Physics. The group’s report was published in July 2009 (PAC, Vol. 81, No. 7, pp. 1331-1343; doi:10.1351/PAC-REP-08-03-05). The Joint Working Party will issue a second report, dealing with claims for the discovery of elements with atomic numbers in the range 113 to 118, in the near future. Page last modified 8 April 2010. Copyright © 2003-2010 International Union of Pure and Applied Chemistry.